There are several good online tools that can quickly review your website and help to identify areas that you may need to improve. Along with the real world website audit we wrote about a few weeks ago, these tools are a great way to make sure you're getting the most from your website and that it's providing a good experience for your visitors. Hubspot’s Website Grader is a nice tool for getting an overall feel of your website's reach and marketing effectiveness. It looks at your content, your SEO optimization and your social media accounts and site traffic among several other metrics. After examining each area it provides a clear, easy-to-understand report with a corresponding letter and number grade. Then, within each section and category it provides some specific and actionable suggestions to improve your score. Running your site through the Grader takes seconds and while the report is really just a top-level overview in many ways, it’s definitely worthwhile. Another tool we often use and recommend is GTmetrix. This test focuses on the performance of your site, or those "under the hood" elements that keep your site running smoothly and performing efficiently. 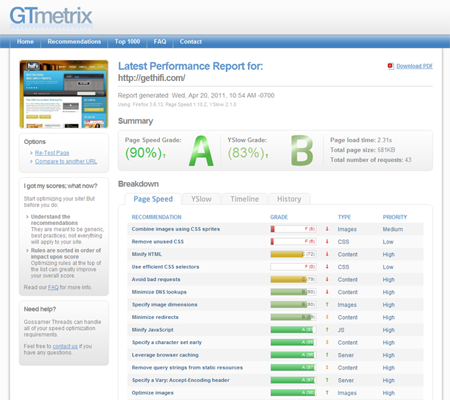 Similar to Website Grader, once you enter your web address GTmetrix will generate a graded report analyzing your site’s code, configuration and optimization. What’s also very helpful is that among the results the most critical areas are clearly highlighted, making it easy to prioritize your next steps. Also worth noting is that the results of this test extend beyond just the back-end code of your site – as a factor in Google's search rankings, the speed and efficiency of your website is something that every marketer should pay attention to and monitor. Both of these free online tools take only minutes to use and they offer some helpful information for reviewing your site. Give them both a shot and use the information to identify some areas of your site that could be improved. What other online tools have you used to improve your website? If you have a favorite that you've found useful, please share it in the comment section!